Monday morning: Are you ready to make it an awesome week? Did you know that 70 % of people speak about what they want to “get away from”? They know what they don’t have, don’t like and don’t want, and they speak about it all day. It is not difficult to spot problems. We all excel at that. Have you ever noticed that people spend a lot of time focusing on problems? They look for problems all day long and 99.9 percent of the time they get just what they asked for. It seems to me that even new and highly motivated employees are getting worn out by this mindset. We have come so “problem-centric” that we can’t see all of the opportunities around us. It’s as if we are blindfolded. Can this be the reason that we tend to move sideways or in circles instead of forward? Be mindful of what you give your attention to. Believe that anything is possible and it will be. Think and speak in a more positive and encouraging manner. Have you ever considered that the only genuine problem you may have is your perspective? Inhale gratitude and tolerance, exhale joy. 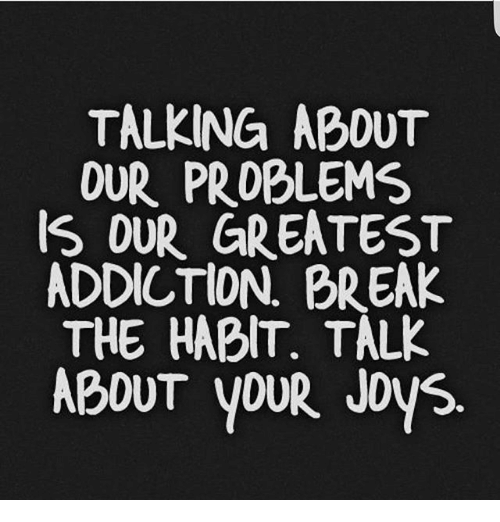 Be joyful. Move joyfully. Speak joyfully. That’s the energy you will create around you. Good energy = higher productivity! Woohoo! What a difference this will make. As always, I am rooting for you.